Gold Cobs from the Florida shipwrecks of the 1715 Fleet & other New World wrecks. Spanish Colonial gold and silver coins from Lima, Mexico, Cuzco, Bogotá, Cartagena, and other mints. L 98. 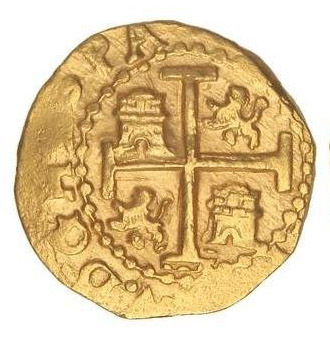 Lima 1703 H two escudos. NGC MS 64 1715 Fleet. Lustrous, well struck, and very choice mint state. Arguably, the finest known among a half dozen collectible survivors. Two sets of dies struck the 12,289 two escudos coined in 1703, all in the second half of the year. 12,289 is more than twice any previous annual mintage and indicates an increased role in commerce for the two escudos. 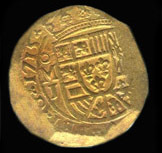 34,562 onzas were struck in the same year, meaning that a record 8% of the 1703 gold coinage was coined as two escudos. 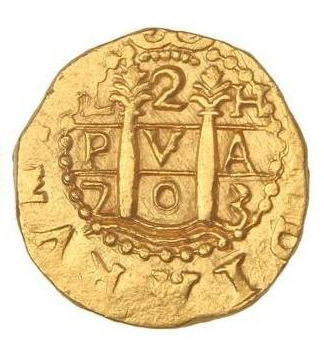 Before the salvages of the 1715 Fleet, exactly one (VF) 1703 two escudos was known to numsmatists. The Fleet has yielded eight specimens of the 1703 two escudos, two absorbed into the Florida State Collecton, including State coin #11.00167 (pictured in Craig). All Fleet 1703's appear to come from the Douglass Beach site, (mis)identified as the wrecksite of the Mexican patache Nieves. Two other choice mint state 1703 exists, one graded as MS 63 by NGC and sold by Heritage five years ago for $8625. The other choice is as yet ungraded. Two Fleet-era MS 64 quality Lima twos, both common date 1710's, have sold in the last six years. In October 2010 Treasure Auctions LLC sold an MS 64 quality 1710, then badly undegraded as a PCGS MS 62, for $10,925. 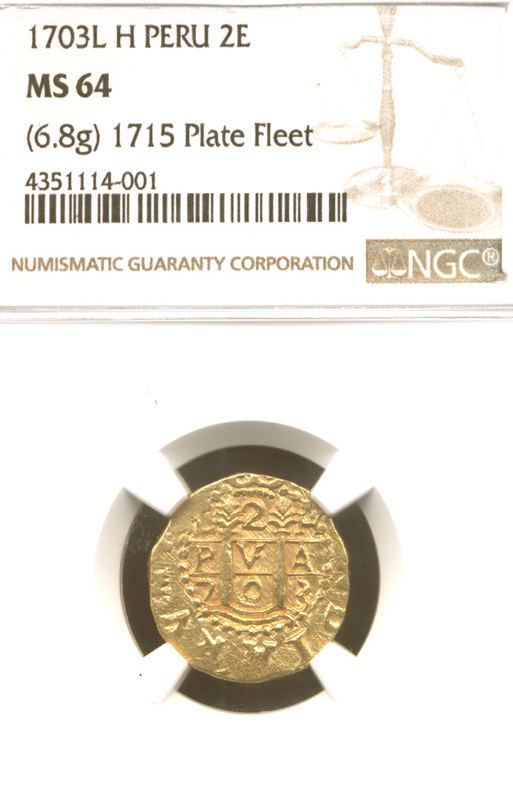 A second 1710, this one in a NGC MS 64 holder, recently sold privately for somewhat more.